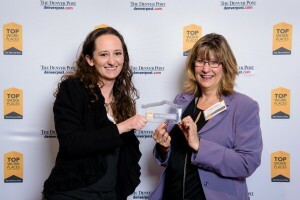 (BOULDER, Colo., April 21, 2016) – 8z Real Estate is pleased to be named in the 2016 Top Workplaces by The Denver Post. 8z ranked fifth in the small companies category. This is the second year that 8z Real Estate participated in the survey, and improved their ranking from 9th in 2015, to 5th in 2016. Since last year’s survey 8z Real Estate has created additional training and support for their Realtors including 8z Academy, a seven day training program that educates them how to use the 8z systems and marketing programs that are already in place, along with adding structure to the mentoring program provided by 8z Team Leaders. The employee survey is conducted by WorkplaceDynamics, LLP, a leading research firm on organizational health and employee engagement. The Denver Post published the complete list of Top Workplaces on April 10, 2016.